The best musky fisherman can be found on the river in every season. While musky feeding patterns can be a puzzle to many anglers looking for a big fight, we can narrow a few factors down for you to make it easier on your outing. Take a look at a few pointers below to help you catch more musky on your quest. Winter: Musky can be found in deep holes, ledges, and close to the bottom of the river. These patterns indicate a pattern right before prespawn. The elusive fish in the French Broad River in NC and Nolichucky in TN will hold true to these patterns. Dredge deep slow moving 4-6 inch flies as close to the bottom contours as possible. Ensure your fly has little to no hang ups with a weed guard (40 pound test around a 4/0 to 6/0 gamakatsu hook). Early Spring: Musky begin to make their prespawn pattern movements into stronger moving currents. Typically when musky are seen during early spring, you can usually bet you will see two more with the big female. This time of year fish are aggressive and will strike at most anything that comes in their territory. Throwing big flies, still in the 6 inch range with a lot of flashabou or bright colors will trigger a strike. Summer: Top-water, subsurface and big flies. Be stealthy. Musky can be found feeding on big 6-8 inch flies and placing your fly just perfectly will trigger a reaction strike. Using sink-tip or sinking line will get your fly to where you need it to be. Summer patterns can be different on warmer days with more wind, colder days with less wind etc. Typically days with more wind, musky will be found close to structure and behind rock shelves. On calm, less windy days, musky can be found eating top-water or subsurface flies with just the right amount of movement. Autumn: Many anglers believe big flashy flies is what makes a musky move. But throwing smaller flies is what makes a musky bite. Many fish will be found feeding in preparation for winter time, similar to a smallmouth or largemouth bass. While many of the baitfish are big there are still some that have a smaller profile and duplicating that profile can make or break day on the river. 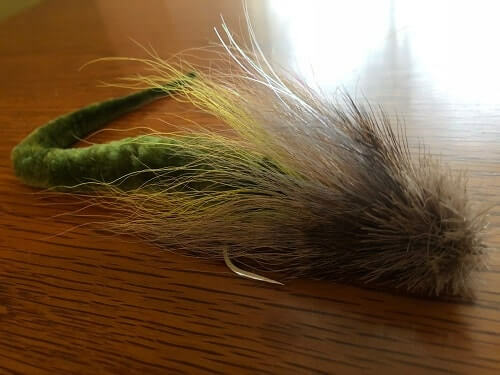 There are many variations of musky flies, articulated streamers and bucktails. But what makes a musky really eat is the question. Our professional musky guides have found the one key feature to a musky fly is the movement. This can be hackle, bucktail, articluation etc. As long as your fly can move freely in the water and on the pause, in between strips, you have a good musky fly. It’s as simple as that. Choose your colors to match the baitfish that are in your river or lake and make sure you have a solid hook to line connection. Do not underestimate the amount of articulation. The more the better! The best musky fly rod that we have found is the TFO Esox 10 wt. The TFO Esox rod has the right amount of backbone to winch in 50 inch fish and enough taper to allow for light presentations on slick-calm days. Your rod is the most important tool you will use while musky fishing. If you cannot steer the fish away from cover or fight him in the direction you need, that is a problem you will need to fix. We will let you choose the reel to pair with our pick of rod for two reasons. Anglers have their own preference on drag systems. As long as the reel is a 10wt, with 10wt sink-tip or sinking line you will have the perfect set up. 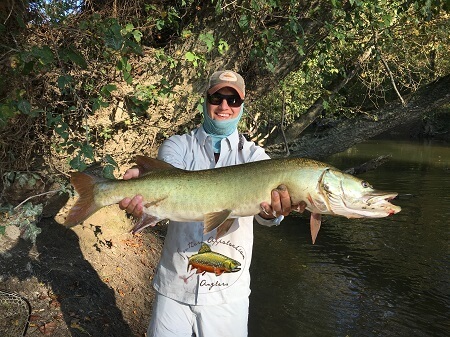 To learn more about musky fishing in the Southeast contact Southern Appalachian Anglers online or call (828) 691-1506 to speak to a professional musky fishing guide.